Dr. Alyssa Sprowl is originally from Stone Mountain, Georgia. 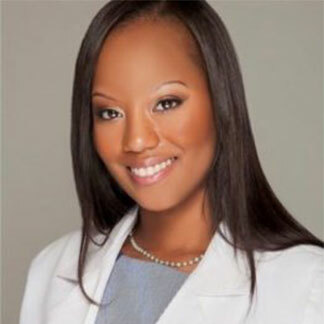 She is a graduate of Hampton University and received her Doctorate of Dental Surgery at Meharry Medical College. She successfully matriculated through her general practice residency at Veteran’s Affairs Medical Center. Realizing her true passion, Dr. Sprowl completed her postdoctoral program in orthodontics and dentofacial orthopedics at the University of Nevada, Las Vegas. Dr. Sprowl was recognized academically throughout her educational career by being inducted into Omicron Kappa Upsilon, a national Honor Society. As a four-year Dean’s list scholar, she also received accolades from the American Association of Periodontology and the American Association of Oral and Maxillofacial Surgery for clinical excellence. Dr. Sprowl is a proud member of the American Dental Association, National Dental Association, American Association of Orthodontists, and the North Carolina Association of Orthodontists. The art and science of orthodontics gives Dr. Sprowl the opportunity to enhance smiles while being a positive role model in her community. Dedicated to serving, Dr. Sprowl has helped mentor young adults interested in the science field and has volunteered with various organizations throughout the Charlotte area. Outside of the office, Dr. Sprowl enjoys spending time with family, traveling, and loving her Shih-Tzu Louii Vuitton and yorkie CoCo Chanel.